Whatever colour combination and branding you are looking for our robust heavy duty Rugby Post Pads are manufactured here in the UK to the highest of standards. 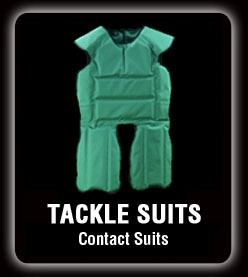 6ft in height, with a padding thickness of 3 inches as recommended by the IRB. We offer a full range of face sizes from 10 to 20 inches. 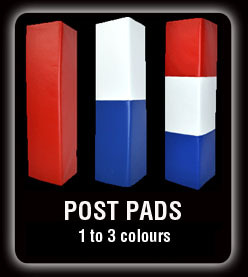 Whether you are a junior or International club, want goal post pads or corner flag padding, we have a range of affordable durable pads for you. We offer a full printing service for club or sponsorship purposes. 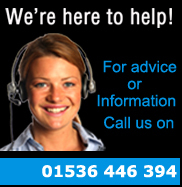 Need further advice or prices please contact us we are here to help. 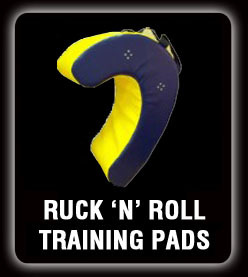 See our range of rugby training equipment below - plus don't forget to sign up to our e-newsletter for special offers! 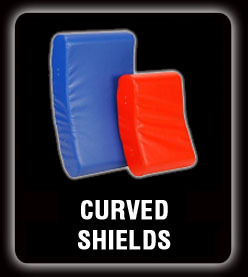 Our rugby padding is made from high quality heavy duty 'rip stop' PVC to withstand high impact and includes a 3” foam inner for ultimate durability and protection. Your rugby post protectors can be fully customised with a multitude of colour options and printing choices available. 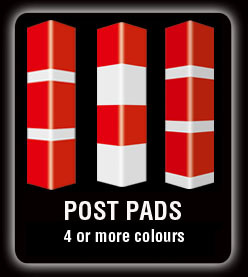 Whether you want your club colours or Sponsors logos, we offer affordable solutions for your rugby post pads. Click here for our full colour range. 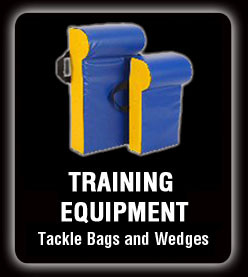 For more details on our full range of rugby equipment call us now on 01536 446 394!